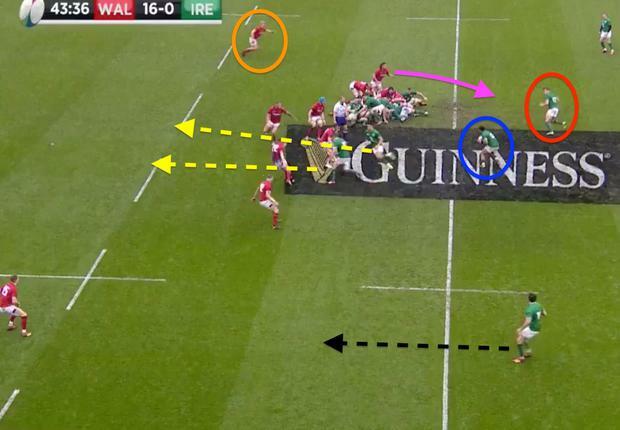 Ireland win a scrum in the middle of the pitch, just inside the Wales half and set up with Garry Ringrose (red) directly behind it and Johnny Sexton (yellow) on the left. 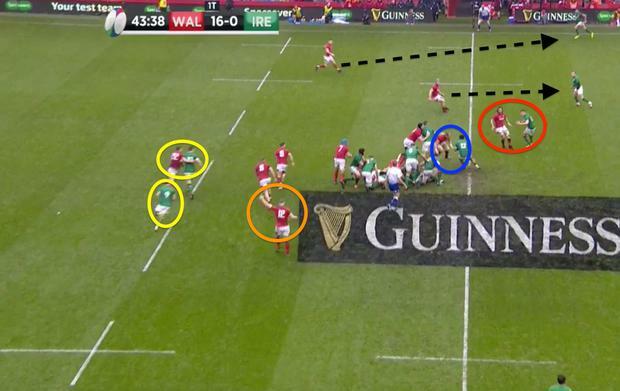 What is interesting here is how well the Welsh defence communicate with each other as if they know what to expect. Notehow both Dan Biggar and Jonathan Davies (blue) are communicating with their team-mates in anticipation of what is to come. There are two contrasting three-minute periods that best sum up Ireland's utter capitulation in Cardiff and when framed side by side, the lack of leadership from experienced pros does not make for pleasant viewing. Gareth Anscombe had just put Wales into a 22-0 lead with a 53rd-minute penalty when Johnny Sexton's restart dribbled along the deck. Ireland launch a dummy switch off the scrum with Conor Murray playing the ball back to Bundee Aki (blue), who stepped in as first receiver with Ringrose (red) arcing on his outside. Murray and Sexton (yellow) have set off on two ambitious support lines in the hope that Ireland will make the line-break. Jacob Stockdale (black) shows a bit of animation on the left wing, which is enough to keep Liam Williams occupied, but the Welsh defence are well prepared for the switch. Davies (orange) sweeps around, while Josh Navidi (pink) does really well to read the play as he shoots off the line to close down Ringrose. Ireland had already been torn asunder by this stage, but what followed typified a day in which the leaders in the team went missing when it mattered most. A minute later Gareth Davies conceded his second brainless penalty of the afternoon when he took Conor Murray out. 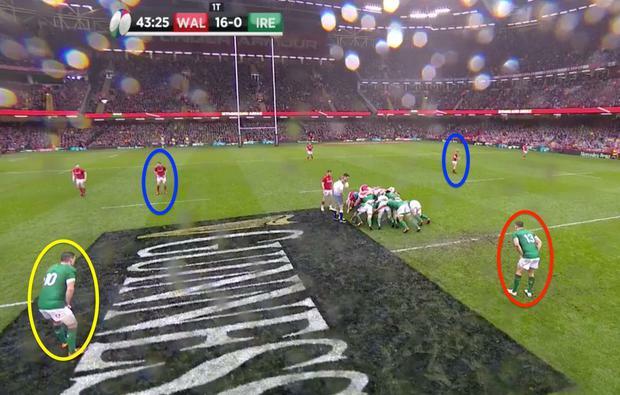 Just outside the Wales 22, it was an ideal field position to find a good touch close to the line and set up the maul. What transpired however, was symptomatic of Ireland's struggles. Murray quickly grabbed the ball and looked around him for reassurance that kicking for the corner was the right option. At 22 points down, it seemed like a no-brainer. Murray and Sexton’s trail runs (yellow) have come to nothing, even though Hadleigh Parkes (orange) spots the potential danger and again communicates with those around him. Davies and Josh Adams (black) have Earls and Rob Kearney well marshalled on the outside. Ireland are hoping for Aki to play the ball to Ringrose, but that option is quickly made redundant by Navidi’s outstanding read (red). Aki (blue) turns back inside only to be smashed by another brilliant read, this time from the inspirational Alun Wyn Jones. The move breaks down and seconds later Sexton boots a towering kick out on the full to sum up Ireland’s inaccuracies. Peter O'Mahony pointed to the corner, and so too did Sexton, who was quickly on the scene. But the question must be asked: why didn't the out-half take the kick? Instead, Murray booted the ball into touch, but the scrum-half didn't execute it well and it left his side with a lineout significantly outside the five-metre line instead of on it. Against the best defence in the Six Nations, such tight margins are absolutely crucial and with no sign of an obvious injury to Sexton, it was baffling that he didn't demand the ball from Murray. Perhaps the scuffed restart was fresh in his memory, but this is the current World Player of the Year we are talking about and his mental fortitude is generally unquestionable. Ireland made a mess of the lineout, with O'Mahony fumbling Rory Best's throw, which disrupted any sort of potential momentum. They managed to recover it before the ball was eventually worked wide where Sexton attempted to link with Rob Kearney. The full-back was clearly not on the same wavelength as his out-half and ran an inside line off his right shoulder with the ball squirting its way harmlessly into touch. Sexton was visibly flustered. You thought Joe Schmidt might look to his bench, but Jack Carty sat there until the 72nd minute, by which stage any hopes of an unlikely comeback were dead and buried. Schmidt said he was trying to play his key half-backs back into form by leaving them on despite another sub-standard showing, but Carty and Kieran Marmion's lively introduction suggested that the Connacht pair should have been introduced sooner. As the clock ticked beyond the red, we saw a stark contrast in the fresh half-backs' body language. With Ireland winning a scrum penalty, Marmion ran after the ball to launch one final play, with Carty demanding the ball so he could fire it into the corner. For whatever reason, Ireland played so little off 10 when Sexton was on the pitch, but Carty's introduction added a fresh dynamic to a stuttering attack. Unfortunately, it was too little, too late. After Quinn Roux won the lineout, Carty had a couple of lovely touches. Firstly he played a good pass to Garry Ringrose before directing the play back inside with a ball off his right to Roux. Seconds later, Carty put a really clever kick in behind the Welsh defence for Jacob Stockdale to run onto and suddenly the home side were being asked different kinds of questions. Carty immediately arrived at the ruck to help secure the ball for Marmion to allow the forwards to try to power over. When they were met by the red wall again, Carty reacted quickest to the loose ball and was tackled just short of the line. He repositioned himself on the right and Marmion fired a good pass to him, which allowed his Connacht team-mate a split second to look up and play a perfect skip-pass for Jordan Larmour to score and avoid Ireland being embarrassingly 'nilled'. Admittedly, this all occurred late in the game against a tiring defence but even still, it's difficult to ignore the impact and energy that the fresh half-backs brought to Ireland's play. The responsibility for the defeat does not sit entirely on Murray and Sexton's shoulders because when a pack is dominated in the manner that Ireland's was, the platform to work off is almost non-existent. However, since the 2015 World Cup, the focus has been on strengthening the talent pool. Six months out from Japan, the trust in the back-up half-backs does not be appear to be at the level it should be.